Workspace of your own . . . wherever you are . . . whenever you need it. Office space for your company . . . wherever you are . . . by tomorrow. Meeting space . . . wherever you are . . . this afternoon. This is space on demand. Workspace becomes a service, not a property transaction. Coworkspaces and ‘space matchmaker apps’ could revolutionise the way in which office workspaces are accessed and used. This is one of the main findings from a new British Council for Offices research report “Space on Demand” launched last week. 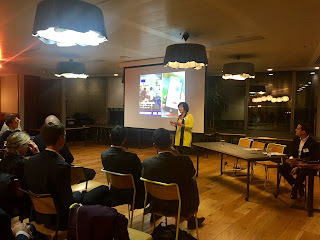 AMA’s Alexi Marmot led the research project and presented its conclusions at WeWork’s South Bank office. ‘Space matchmaker apps’ and ‘space on demand’ (terms coined by the authors) describe a growing set of technology applications and platforms that match people seeking space to spaces seeking people. ‘Space on Demand’ reviews the growth of both coworkspace and space matchmaker apps, and examines the underlying reasons for their growth. The report identifies the scale of change to date and identifies the impact of space on demand for property investors and developers, for urban planners, corporate occupiers and office space users. One million people are predicted to be members of coworking spaces globally by 2018. The rise of coworking can be explained by growing demand for office space coupled with the power and ubiquity of digital tools and data, and the rise in flexible working. Coworkspace is a way for companies to outsource their requirements for space, infrastructure and its management. It often comes bundled with other services. Sociability, connection with others, flexibility, and a cool, non-corporate atmosphere, design and layout are all part of the appeal and the marketing. Matchmaker apps allow customers to find and book space and operators to manage the space. They also help coworkers in a particular community to engage with one another for business or social reasons. The report argues that these are disruptive innovations. Companies providing digital platforms that enable peer-to-peer exchanges are, in some cases, outstripping traditional market leaders. The potential benefits of better using property resources, and reducing time and energy wasted in unnecessary commuting, are profound. Yet the sustainability benefits offered by coworkspaces and space matchmaker apps have been little noticed or understood. Alexi's presentation was followed by a lively panel discussion featuring Cal Lee of Savills, Nigel Fuller from Legal & General and Leesman's Chris Moriarty, ably chaired by Steve Lang of Savills. The new book is the collaborative effort of 15 international experts in the fields of workplace strategy, human capital, real estate, technology and business. The book helps organisations prepare for the future of work, workers and the workplace. 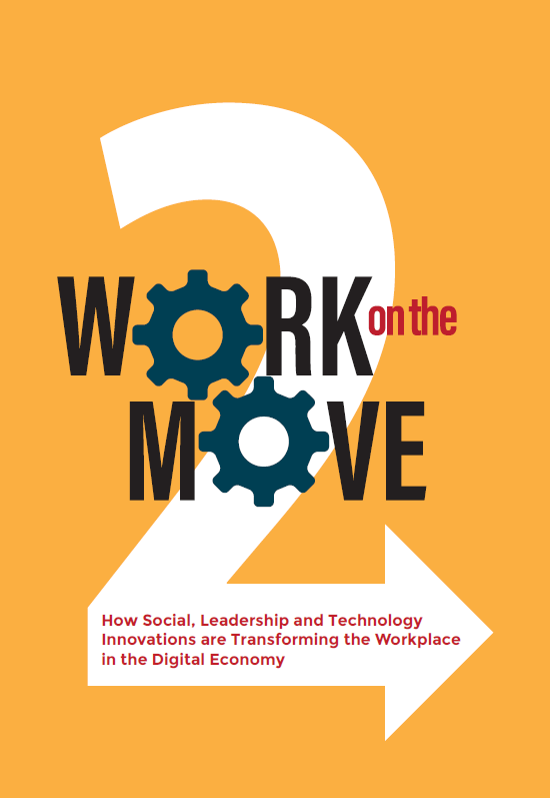 The concepts shared in this new book help companies understand how to achieve critical workplace transformation in today’s digital and shared economy. Showcased are 17 case studies of great workplaces around the world with an emphasis on their impact on the triple bottom line: people, planet and profit. Topics covered include: the latest global workplace trends, leadership changes, as well as the changes occurring in social responsibility; the increased importance of employee well-being; the silo-busting going on in real estate, human resources, information technology, and facility management groups to lead workplace change; new technologies being experimented and deployed for greater productivity and engagement of workplace professionals; and a day in the life of a future ‘placemaker’. Co-editors Nancy Johnson Sanquist and Diane Coles Levine had a vision for the first edition of Work on the Move, to “raise awareness within the facility management profession and create a vibrant movement of disparate, forward-thinking professionals dedicated to improving the workplace.” This book was the catalyst for the creation of the IFMA Workplace Evolutionaries (WE), and two Workplace Strategy Summits; the first held at Cornell University and the second in cooperation with University College London. Sponsored by FM:Systems, Kimball Office, Planon, and Trimble, as well as other organisations, 100% of the proceeds of the book will support the mission of the IFMA Foundation’s Global Workforce Initiative (GWI). Visit the Work on the Move website workonthemove.com for more information and to share your thoughts, ideas and case studies. AMA design director David Jenkin has contributed to a new book about the way users experience library spaces and services. 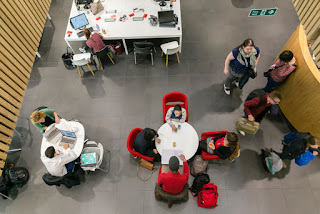 David, together with Bea Turpin, Deborah Harrop, Edward Oyston, Maurice Teasdale and John McNamara, considers what makes an informal learning space, based on work for Sheffield Hallam University. AMA won a competition to help Sheffield Hallam upgrade the Adsetts Learning Centre at the heart of the campus. As part of a three year, multi-phase project, AMA’s designs integrated exciting and engaging social learning and group study spaces into a wider mix of learning facilities. Increasing clear views across spaces and adding colour highlights further enhanced the environment. Helpdesk facilities were improved and new worksettings, including shared meeting booths and presentation rooms, were positioned in prime space liberated by relocating staff. User Experience in Libraries, subtitled Applying Ethnography and Human-Centred Design, is edited by Andy Priestner of Cambridge University and consultant Matt Borg. Incorporating contributions from librarians, anthropologists and designers from the UK and the US, the book offers guidance, analysis and case studies of user experience research and seeks to ignite interest and enthusiasm in this “emerging and game-changing field” that has the potential to make a significant impact on the way librarians currently deliver services. It will be published by Ashgate in April. 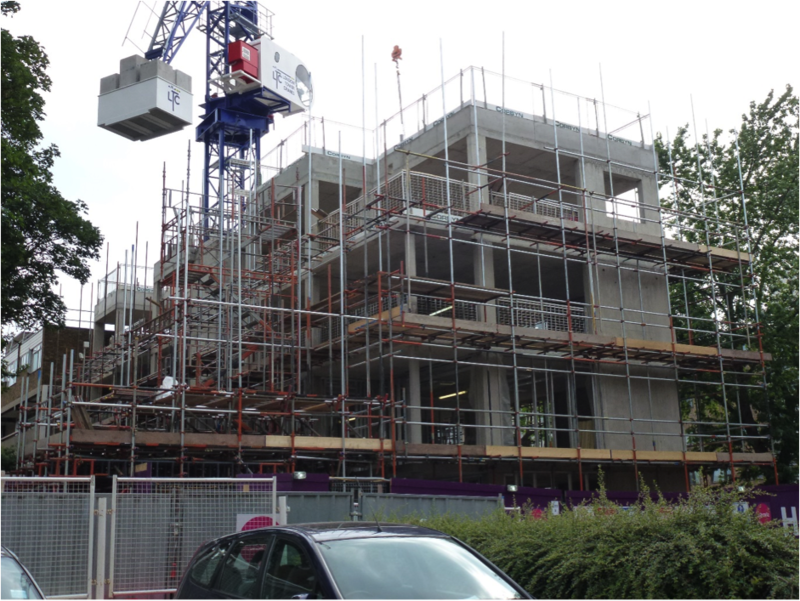 AMA is working in the Mott MacDonald team on two projects in Peckham. The Cator Street Dementia Daycare facility (centre of Excellence), and Clifton Housing. 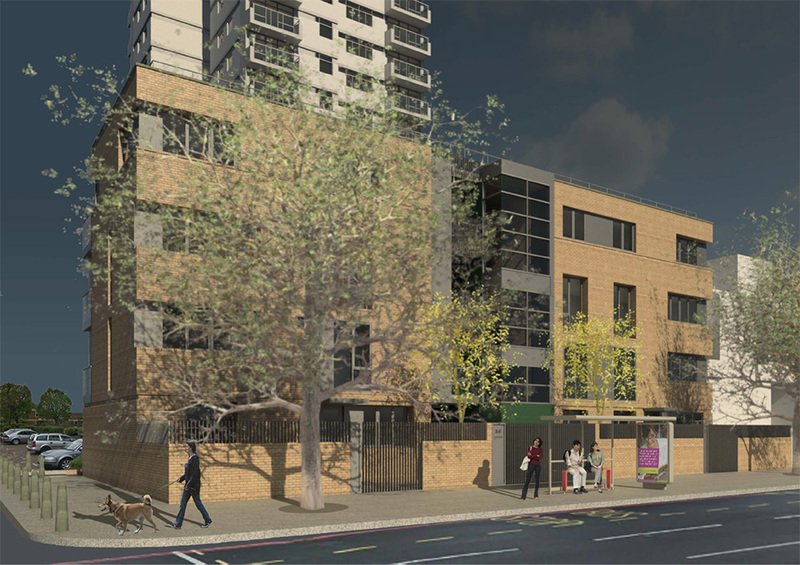 The housing scheme will provide 8 units, including one accessible unit, and is currently on site and due for completion early in 2016. This is a very difficult and tight site. Formerly a series of underused garages it was important to knit the proposals with the local infrastructure and community needs. The project was overwhelmingly popular with local residents and at public meetings the reaction was totally positive and the proposals seen as a strong indicator of major improvements in the area. AMA’s role was to develop proposals for this tight site and get the best orientation possible on this polluted and inhospitable road. This was achieved by good acoustic insulation, putting living rooms to the quieter east side, and the option of using fresh air mechanically delivered from the cleaner rear areas. Alexi will describe how AMA helped to articulate and deliver a new vision for the Commons building at Bath Spa University. Design Director David Jenkin led the interior strategy, consultation and design. Commons is a fascinating, flexible and innovative new facility. 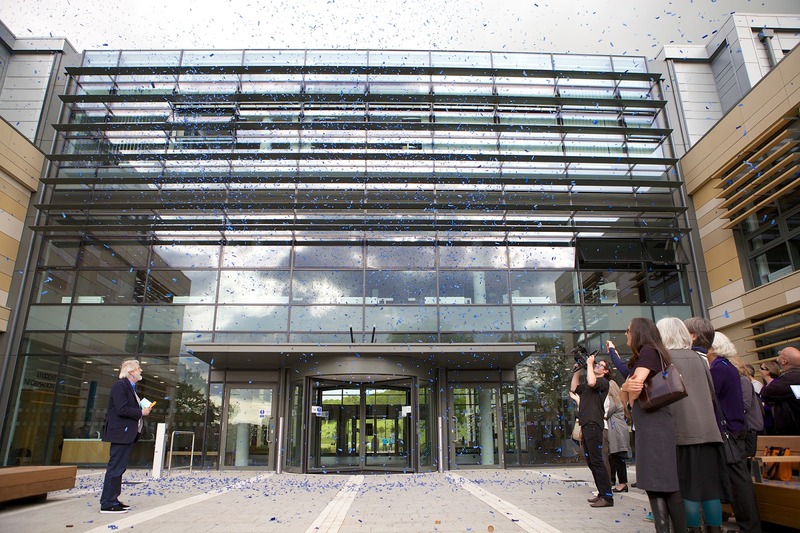 Designed by Cube Design and opened in 2014 by David Puttnam, it is the university’s largest building at 8,000 sq m and the hub of the Newton Park campus. Commons was conceived as a different type of university building. Providing learning, teaching and meeting spaces, staff work bases and major specialist digital studios, it needed to be highly flexible, fit for the current and next generation of students and staff. 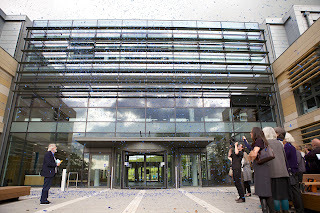 The new building represents quite radical change for the university. Staff and students share the same building, and many of the same facilities. Academic staff work in a club-type zone with few conventional workplaces, none individually owned. Elsewhere, teaching rooms are interspersed with breakout and group study areas in local hubs. Interactive group learning spaces, individual and quiet study areas, are provided generously on the ground floor alongside a design lab, recording studio, and large flexible conference room. Do universities need ‘iconic’ buildings? 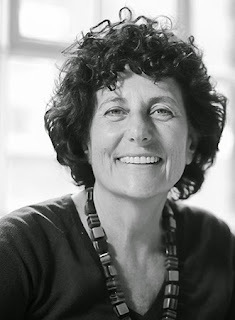 In an article for the Guardian Higher Education Network, Alexi Marmot questions the benefits of buildings commissioned to make an impact. Ambitious university leaders bring together “starchitects” and wealthy sponsors eager to provide funds for flagship buildings. Starchitects play with the ideas of crumbling buildings, irregular shapes and angular geometries, rather than conventional vertical planes and rectilinear structures. Their designs hint that universities are organisations whose mission is to question traditional ways of thinking, to break down conventions. Do such ambitious buildings really work for the staff and students for whom they are designed? 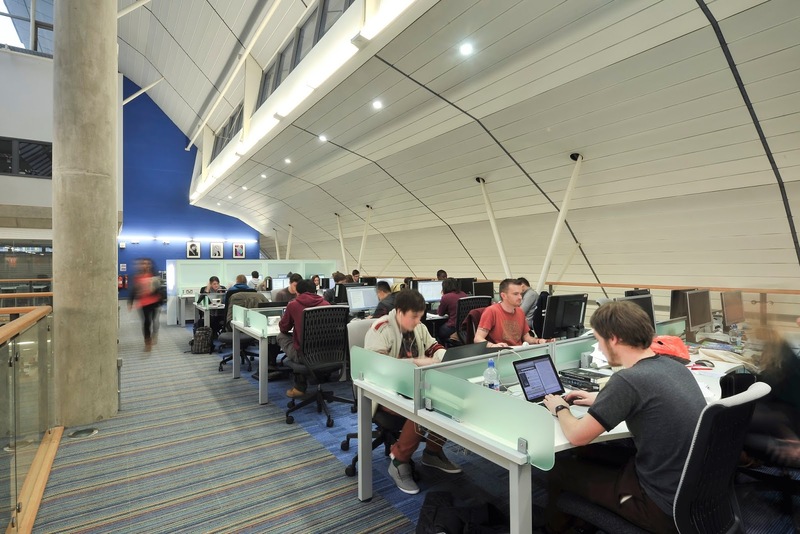 What aspects of the new buildings stimulate better teaching, learning and research? Might more restrained and elegantly designed buildings meet university requirements just as well? Can unpretentious, cheap buildings erected rapidly by design and build contractors, satisfy users? We need much more solid evidence to answer these questions with conviction. Research on “post-occupancy evaluation” – how buildings are perceived by those who use them – is still rather unusual, although it is always recommended. University estate directors have collaborated on a methodology for conducting post-occupancy evaluation through the Higher Education Design Quality Forum (HEDQF) – but few apply it. 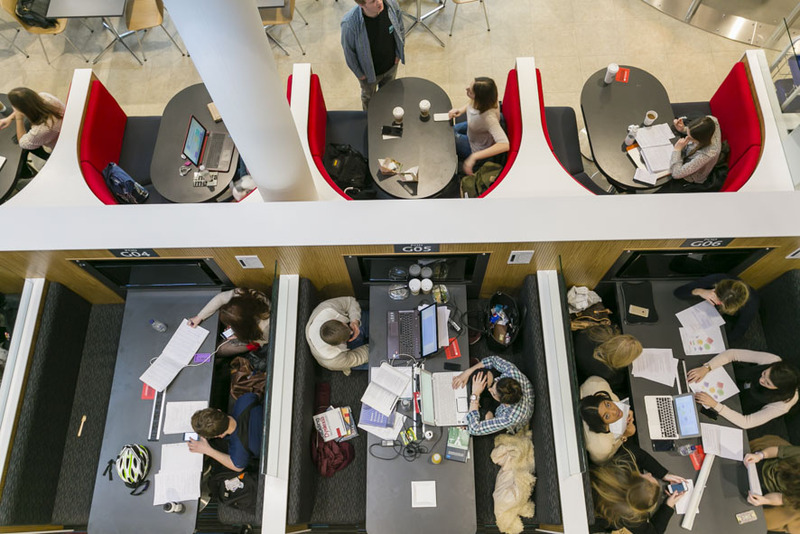 National Student Survey results for 2015 show that 86% of undergraduates are satisfied with their learning resources (library, IT and access to specialised equipment, facilities and rooms.) Good news, but it does not illuminate whether particular buildings or features are positive. 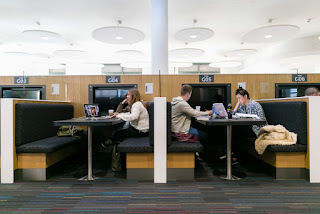 Other research shows that the staff are generally less satisfied with their facilities than students are, which could mean they negatively impact on their research and teaching. But this year’s sector efficiency report led by Sir Ian Diamond rates 85% of HE space as good to excellent. 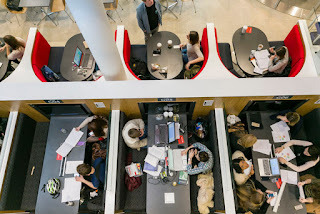 Radical shifts in the way students earn and digital technologies for teaching and learning - virtual learning environments, lecturecasts, online quizzes, webinars, skype tutorials, flipped classrooms, Moocs - make new demands on buildings, data connectivity and infrastructure. They also raise the prospect that education can be delivered without going to a place called a university. 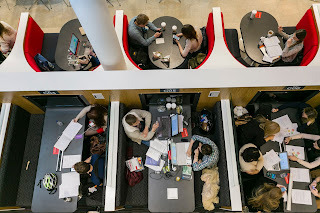 When asked their views, students commonly complain about poor internal air quality and temperature, and express the need for more spaces for group work with their peers, more computers and computer rooms. They want “make spaces” for creative experimentation, and more social learning spaces, and they want these spaces to be open 24/7. All university buildings – the new and the old – need to respond to evolving requirements. Flexibility and adaptability through time is one of the most precious attributes of all HE buildings. European universities and their architecture have already endured for more than a millennium, and more than 800 years in the UK. All have grown dramatically in the last century and continue to grow, even as online learning accelerates. Their future success and survival will be aided by better and more adaptable buildings, based on a well-researched evidence base.